I had my doubts about this event, since we were interpreting the death and mourning of John Brown a full month after it actually happened, and initially resisted somewhat strenuously. But people change, and by the time I was operating a motor vehicle at high speed on I-90 six months later, I could be– and was– convinced. 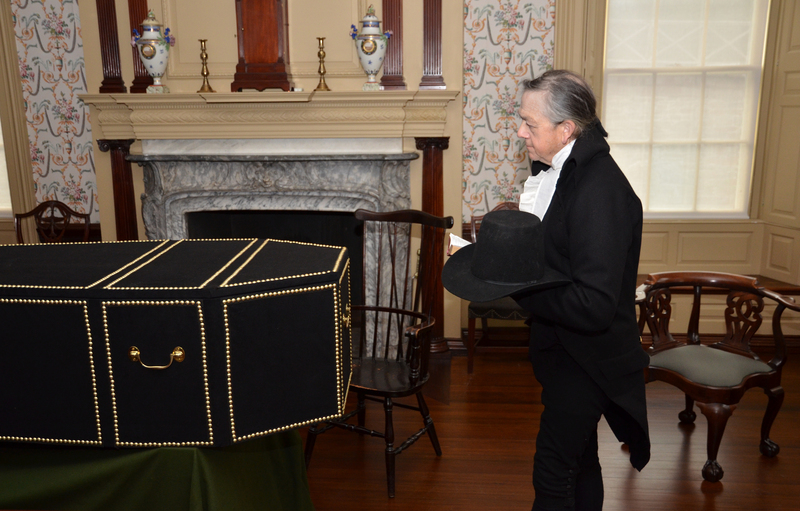 Knowing little, if anything, about early Federal mourning customs mattered not at all. There’s always time to learn, right? Well… if you read fast enough, you can do anything. Despite the bustle, Esther and I found time to cover many of the mirrors with sheets, and the portraits with black crepe; this is a time of reflection, not vanity. It gave our rooms a gloomy mien, and reminded us of our short span on this earth. We did have many callers Saturday afternoon, as John Brown was such a significant figure in Providence. He accumulated significant wealth, as Mr and Mrs Thurber attested when they came to inquire about the profits from the voyage Mr T had invested in– $30,000! Thirty thousand is a fine sum indeed, though one wonders where Mrs Thurber might spend those proceeds. While a generally refined person, she made many inquiries about sherry, so I was relieved I’d had the foresight to lock away the decanters. So many people call during a time of grief that you cannot be too careful. 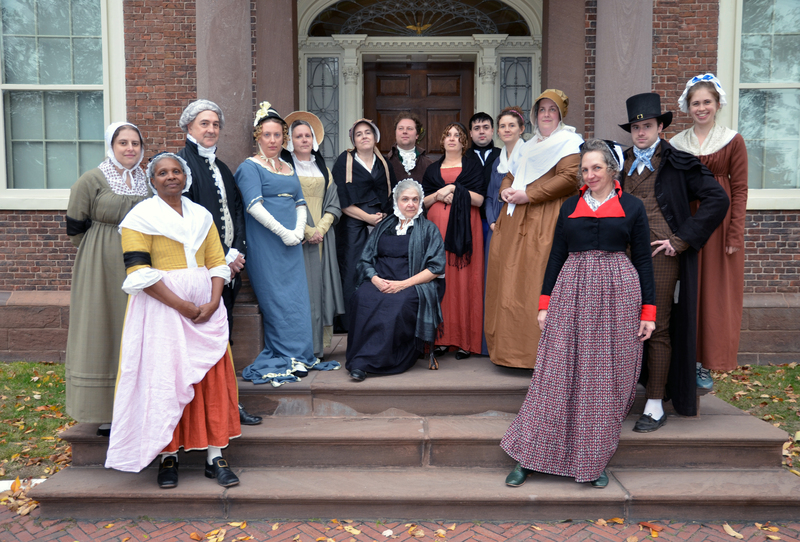 The mantua maker came to call, bringing black silks and plates for the ladies to choose from. 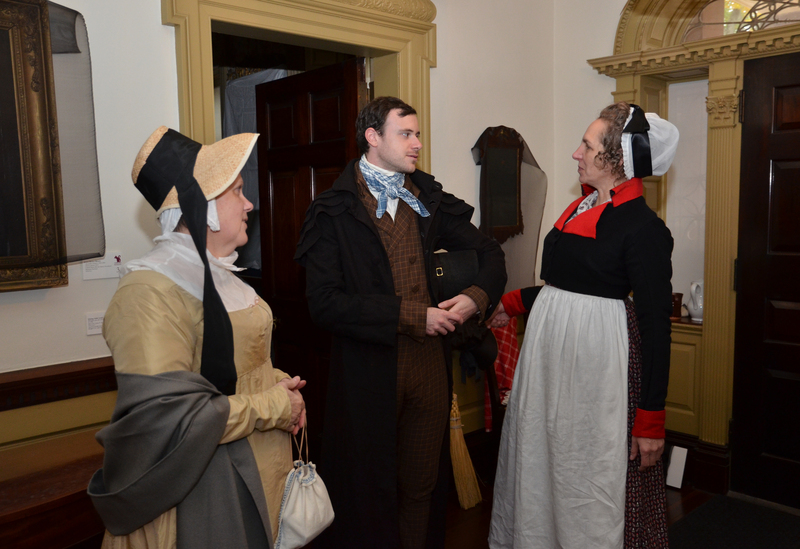 We have had a mix of joy and sorrow in this house, and it is only of late that Mrs Francis (on the left, in blue), has left behind her more matronly garb following the death of her beloved husband John Francis in 1796. It was a crushing blow for her, but she does seem to have recovered now. 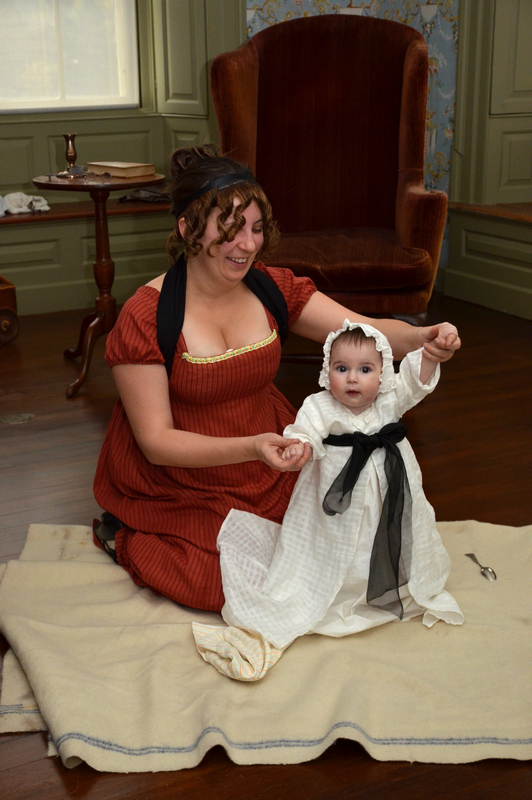 Mrs Herreshoff was with us, visiting from Point Pleasant in Bristol, and her mother found baby Anna, now just more than five months old, a great consolation indeed. Anna was dressed in mourning for her grand-papa, though she will not remember him. Despite the many callers, baby Anna was truly an angel. 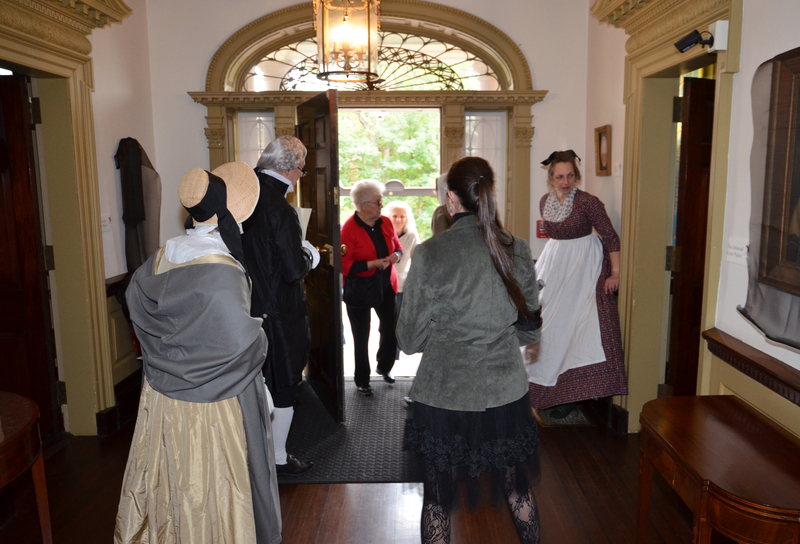 The ladies upstairs were a respite for us servants, though we were comforted by the visiting minister from the Congregational church. They cannot make up their minds to a new minister, now that their beloved Dr Hitchcock has left them for heaven. They try on new ones for size nearly every week, and while that is not my congregation, I do think the Reverend Cooke is an excellent choice, combining devotion with humor. A more troublesome caller was Mr Richard Hoppin, son of the sexton at First Baptist church. They do possess the sole hearse in our town, and kindly (for a fee) provide it in times of need. I’m not certain of Mr Hoppin’s stability, for he was inclined to– well, to hop!– in our hallway, a most inappropriate action. The widow did seem to cause him fright (she is a formidable personage, as one would be, after so many years married to Mr Brown), so perhaps he was merely addled by his encounter with her. She wisely inquired after the solidity and soundness of the hearse, for Mr Brown was a substantial figure. Mr Brown was a great support to us all, and his absence will truly be noted in our household and in our town. I do expect the house will feel empty without his presence, and that Esther, Goody and I will much remark upon the quiet as we go about our tasks. The obligatory group photo finale. From an administrative and managerial stance, this What Cheer Day was different: we cut the interpreted day in half, running the event from 1:00 till 4:00, but still saw about the same number of visitors as we had in a six-hour day. 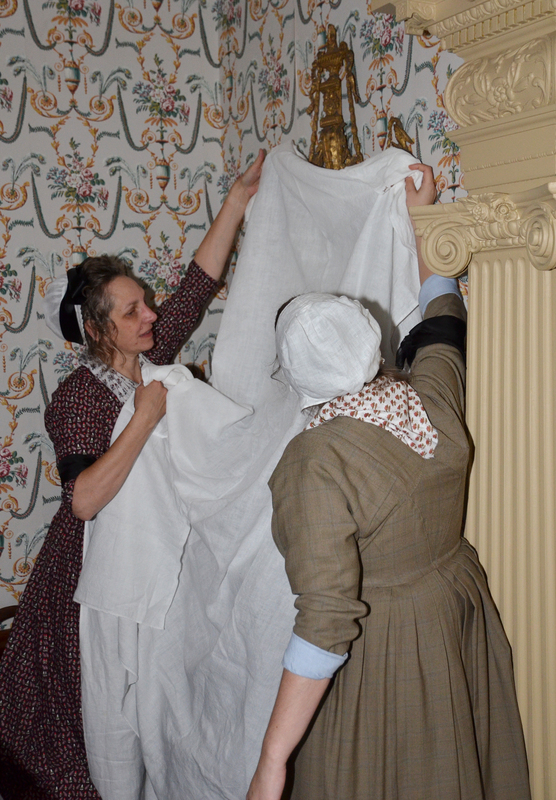 A shorter day meant interpreters were somewhat less exhausted by the close of the day (costumed staff who started their day at 5:00 AM excepted), and the schedule did not have to be as detailed as in previous years. 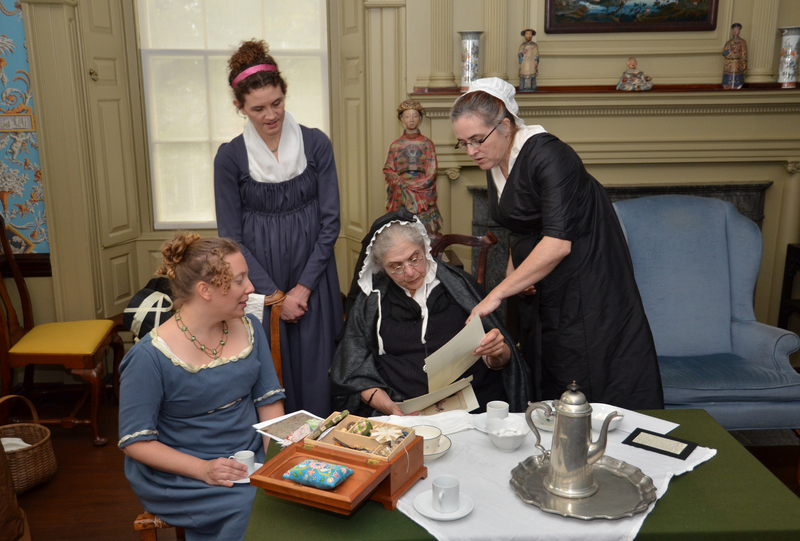 We also reprised a “make your own miniature” activity from the August George Washington 1790 event, and brought in period musicians, who played in the Washington Wallpaper room while people colored miniatures. 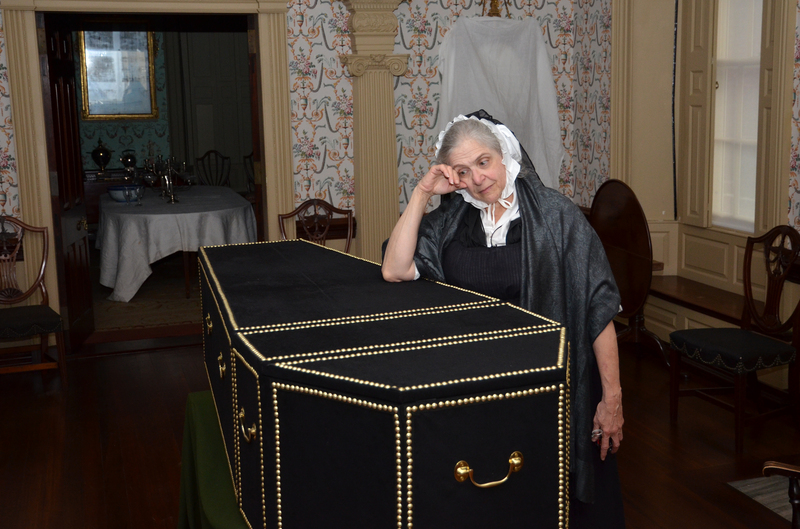 We also put out an exhibit of memorial art and mourning jewelry, to help contextualize the miniature activity. 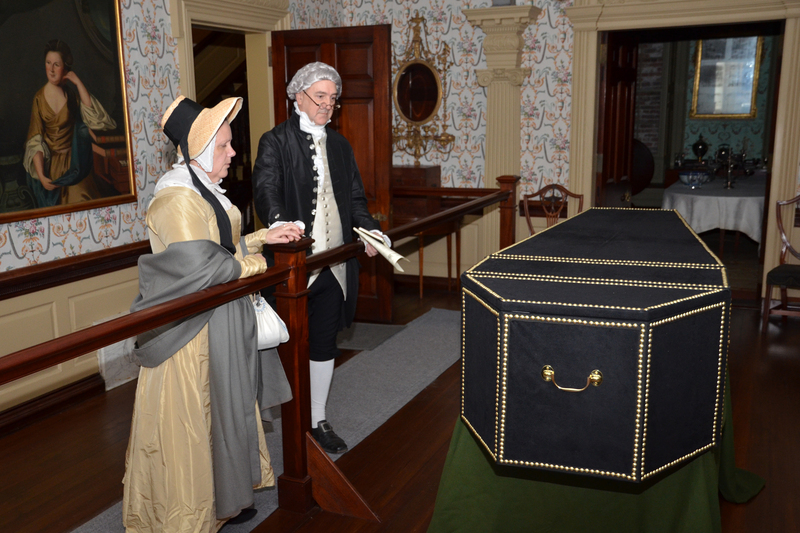 Since we’ll be leaving the coffin on display and the mirrors and portraits draped through next weekend, a small display (three cases, labels finally finished at 11 AM on the day of the event) seemed like a good idea and opportunity. Upsides: chance to show off the collection, engage people in a hands-on activity, multi-sensory experiences. Downsides: Slightly more to accomplish than hands to do the work, still short a servant, always a little rough the first time you change topics. 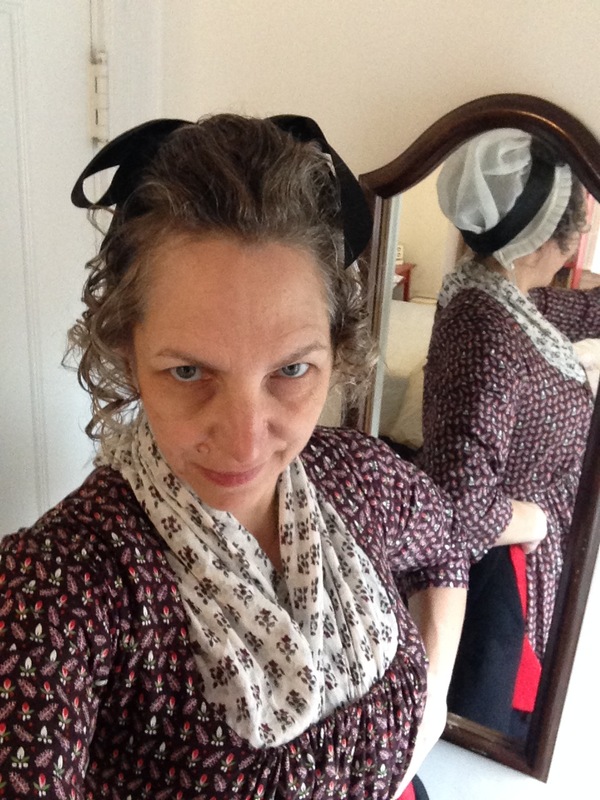 Unexpected bonus: slightly bumpy transitions in personal life make a suitably sad housekeeper. Score! It is indeed a permanent addition, though we are not entirely certain where we’ll be putting it…space being, always, at a premium in Tiny State.